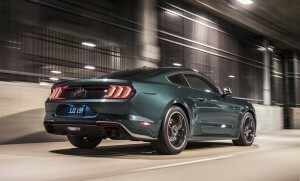 At the Detroit motor show Ford has unveiled a limited edition Mustang, faster, more powerful, the usual stuff. They’ve called it Bullitt. And it occurs to me that a great deal of people will assume that the folk at Ford can’t spell Bullet. Ah, they’ve never seen the finest car chase in the history of movies. 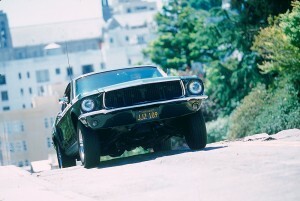 The movie was called Bullitt and it was made in 1968. It starred the king of cool, Steve McQueen. He played lieutenant Frank Bullitt, a cop, and as cop movies go it was pretty damn average. The reason you watch is for the 10 glorious minutes of the car chase. This was before special effects and computer graphics and green screens, this chase is an actual in-the-flesh chase and it is remembered with reverence by car enthusiasts. In fact it’s much of the reason people buy Mustangs. 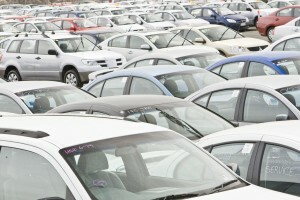 It is obviously remembered especially fondly at Ford. Sensitive readers, those who look forward to the next Nescafe TV commercial, may care to eschew this page. I write about car chases. 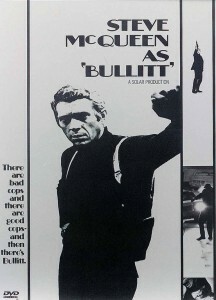 In a movie review an issue or two ago I suggested that the car chase from the 1968 Steve McQueen movie “Bullitt” was unlikely to be topped. A reader in South Australia disagrees passionately. Interestingly, he has never seen Bullitt, but his point is that anything produced 30 years ago on the budgets they had then couldn’t hope to compare with modern technology and financials that require a twelve-digit calculator. Oh, I beg to differ. Let’s analyse those ten glorious minutes in Bullitt and why they blow everything else into the weeds. First of all, there’s the build up. The action starts slowly with the bad guys in a black Dodge Charger R/T discreetly following McQueen in his green Mustang (registration JJZ 109 – there’s a green 1967 ‘Stang getting around Melbourne with the same plate). They lose him and then, suddenly, there he is in the mirror. Hunters become hunted. The action is still very legal but rising music and a bad guy buckling his seat belt are sure signs that it ain’t gonna stay that way. Now consider the streets of San Francisco – rapid drops between flat intersections. A car bottoms out on entry and launches wonderfully on departure. Suddenly the Charger’s tyres scream as it loops around a neighbouring car to go left from the right-hand lane. 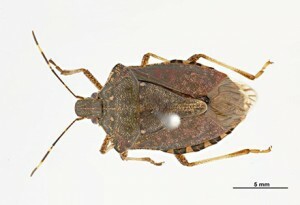 Adrenalin. The music stops. Totally. All you get from now is engine noise (serious V8 iron here with racing changes of the manual shifts) and tyres losing their tread. There is absolutely no peripheral activity, the action never leaves the two cars. You don’t see other cars crashing into poles or out of control, you never lose sight of the target. The only exception is a motorcyclist who comes unstuck (I have read interviews with three different stuntmen, and actually talked to a fourth, who claim to be this guy) when McQueen looks around to see if he’s okay. Otherwise no screaming police cars in pursuit, no helicopters, no mums with pushers, it’s just the good guy chasing the bad guys. Nor are there gimmicks or stunt driving techniques, it’s sheer speed and G forces. When McQueen muffs a turn he doesn’t flip the hand-brake to exit, he backs up in flurry of tyre smoke and tries again. The action moves from weaving city traffic to sheer straight-line speed on the turnpike, and the glorious sequence where McQueen, sideways in the dirt to avoid the motorcyclist, loses sight of his quarry and has to catch up again to re-appear in the mirror. Sensational sound and vision of a single ‘Stang going like a cut cat. There’s no conversation either. McQueen isn’t yelling excitedly into a two-way radio, the bad guys don’t even talk to one another, there’s nothing to take your attention away from the action. And there’s the close. A shotgun out the rear window of the Charger, unbroken yellow centre lines which keep being crossed, sideswipes. All leading up to the Charger’s airborne entry (hubcaps flying) into a filling station, the resultant explosion and the ‘Stang’s inglorious path to the drain it winds up hanging over, it’s front right wheel akimbo. 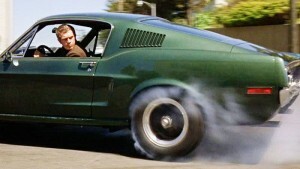 The car chase in Bullitt is a match of equally skilled, ice-cool drivers in omigod brutal cars going like their lives depend on it, and it doesn’t introduce a single element to interfere with, or water down, that theme. It’s amazing to me that no other director has picked up on Peter Yates’ dead simple approach. At the end of the day, 30 years have done absolutely nothing to reduce the excitement of this sequence, and if you have any trouble believing that, just have a look at it. By the way, don’t bother with YouTube, they only seem to have bits of it and you need to see the full ten minutes. Nope, get the DVD. And while you’re down at the DVD shop check out Rendezvous of 1976, a nine-and-a-half minute movie by French director Claude LeLouch and originally titled C’était un rendezvous. Not exactly a car chase but dead exciting and, again, all completely genuine. How to find parts for Saabs.